Do you hear squeaking, screeching sounds, is your brake pedal pulsating or going to the floor? Motor on in for a full free brake inspection. 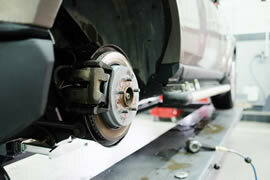 We’ll diagnose your vehicle’s brake problems and offer brake repair solutions that fit your budget. All our work is backed by our 12 month/12,000 mile warranty.